‘Open City’ is not an easy book to discuss. The city it refers to is New York, where the majority of the book is set, besides a jaunt in Brussels and flashbacks in Lagos. Perhaps continue reading this review with LCD Soundsystem’s New York, I Love You But You’re Bringing Me Down in the background. Then you’ll be on the right track. Even without knowing Cole’s background, the book is written in such a way that it could easily be autobiographical. As many have said, ‘Open City’ is as close to a diary as a novel can get, making it almost seem impossible for someone to write such vivid images and capture the smallest details without living them personally. Not in a unwelcome way, the book seems to have flirted with the idea of becoming either a novel or a diary and settled for the structure of a novel, with numerated parts and chapters, yet the personal and descriptive nature we expect of a diary. It seems like someone has ripped out a year of Julius’s beautifully written and poetic diary, as there is no obvious plot to the narrative as such, but rather personal musings, encounters and thoughts. In fact, it wasn’t until I finished the book and went back to find a quotation I liked that I realised there are no quotation marks for speech between characters, with conversations simply being a part of the narrator’s stream of consciousness. So it’s a novel that’s like a diary that’s semi-autobiographical, doesn’t have any particular plot and people rarely speak to each other. 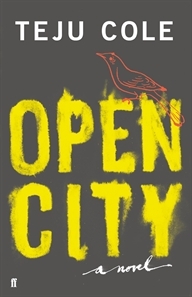 Foremost, ‘Open City’ is extremely well-written and anyone wanting to reignite their faith in modern literature should eagerly seek it out. The prose is so smoothly written it’s like being hypnotised – but not in an I’m-about-to-fall-asleep-from-boredom way. Rather than feeling for Julius you feel with him, as while my life couldn’t be further away from his and not having visited either New York, Brussels or Lagos, I found myself sharing his sorrow and discomfort. And there seemed to be a lot of that. ‘Open City’ is not a jolly read. Julius isn’t a particularly admirable character, and I spent much of the novel feeling sorry for him – although there is a revelation at the end that I feel was deliberately meant to make you aware Julius is not a victim. Having said that, the book isn’t overtly melancholic either, but is frank and observant, rather than emotional. I found this is a key strength of the book, as you want to read more to see how, when or if Julius will snap. This keeps you engaged on the premise that Julius’ morality may be genuine or self-imagined and let’s you focus on the other characters and settings around Julius that appear much more interesting and emotive in comparison. What I enjoyed most about the book is the honest and aching encounters Julius has whilst on his journey. We learn very little of Julius’ private life, basically having to guess ourselves from clues of his half-African half-German heritage. However, during brief meetings, we learn more and more about the city and the people he meets within it than we do about him. This is the platform for the main multicultural themes to blossom. From the perspective of an International Studies student, these encounters with detained Liberians, a Haitian shoeshiner, an outraged Moroccan student, an elderly Japanese doctor and a group of Rwandans gave the book worth along with musings on literature, popular culture and critical theory that address what it means to belong (or not belong). Cole manages to humanize these characters so briefly while still distancing us from the character whose path we share, which makes these characters the part of the book that resonate with you long after its been completed. ‘Open City’ will offer you a book with heart where you don’t expect it, and a different take on New York City than the one you might be used to. As you might be able to tell, I still can’t quite figure out what the point to it all was, but I’m glad it didn’t have one… I think I appreciated it much more because of it. This entry was posted in Books and tagged creative non-fiction, lip lit, teju cole. Bookmark the permalink.